ROCKEY5TIME is a smart card dongle whichp rovides a highly secure full-featured software protection solution for software developers over a number of operating plat forms. It is ahigh-speed driverless Human Interface Device(HID), equipped with built-in real time clock which functions independently of the mainsystem clock. Additional security componentsinclude high-strength encryption algorithms such as RSA (512/1024/2048), DES, 3DES, SHA-1MD5 and AES. 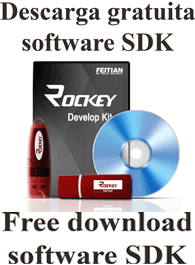 Besides that, ROCKEY5TIME also provides abundant APIs for developer to extend and integrate the dongle function to their programs. The Remote update system can update dongle in a secure way and eliminates the need for manufacturers to retrieve the dongle. Through these features software developers can easily employ various sales patterns like lease, trial and sale on application features in an absolute pirate-free way.